It has been incredibly heartening to see the ways in which Wear Red Day 2016 has engaged both those local authorities, schools, organisations & individuals who have supported the campaign over a number of years, and those for whom Wear Red Day 2016 represents an introduction to the work of Show Racism the Red Card. SRtRC would like to encourage all local authorities to get involved in WRD16 in as many creative & unique ways as possible. Stockton-on-Tees Borough Council will be reinforcing their commitment to equality and demonstrating a firm zero-tolerance approach to racism on Friday 21st October by getting behind Wear Red Day 2016. The Council have whole-heatedly embraced the concept of Wear Red Day and created a blue-print that we would hope to see mirrored by other Local Authorities throughout the UK. Information about how schools can get involved in raising funds to support the delivery of anti-racism education has been sent to all Primary & Secondary schools in the borough, with council leaders urging them to get involved in the fun and highlight their school’s proactive approach to celebrating equality & diversity. All ten local librarys will feature Wear Red Day displays and collection points, with staff & visitors being encouraged to wear red & donate on the 21st October as a visible demonstration of their opposition to racism. The council have combined promotion of Wear Red Day 2016 with next week’s National Hate Crime Awareness Week (8th – 14th October) activities having recognised the complimentary nature of the campaigns and their messages. Councillor Steve Nelson will be taking part in a photo call with former professional footballers from the SRtRC campaign to highlight the area’s support for Wear Red Day and promote the message to as wide an audience as possible; encouraging as many of the borough’s businesses & individuals to get involved and get fundraising. Finally, on Friday 21st October, the lights around some of the borough’s most prominent landmarks including Stockton Riverside & Stockton High Street will be turned red in support for and recognition of Wear Red Day 2016. For more information about how your Local Authority can get involved in Wear Red Day 2016, contact SRtRC on 0191 257 8519 or email info@theredcard.org – you can also read more about Wear Red Day & the variety of people backing the campaign here. Click here to download your Wear Red Day 2016 Fundraising Pack which includes details of how to register. 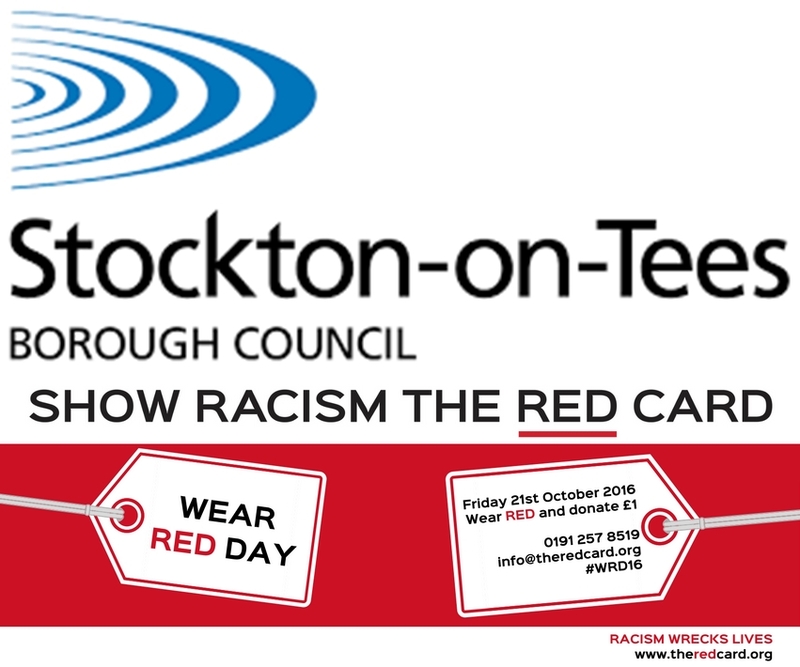 Show Racism the Red Card would like to thank all at Stockton-on-Tees Borough Council for their exceptional support for Wear Red Day 2016, especially Councillor Norma Stephenson, Councillor Steve Nelson & Senior Cohesion & Diversity Officer Satnam Singh.